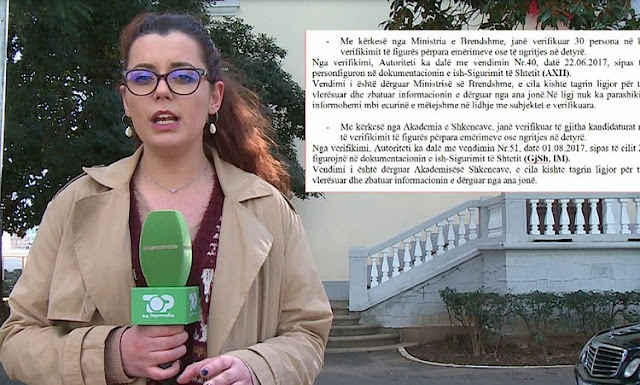 The State Information Security Authority showed to Top Channel (TCH) the initials of 30 spies and associates of the most notorious communist institution. Two of them, with the initials Gj.Sh. and I.M. actually are working at the Academy of Sciences of Albania. It has been the highest Albanian intellectual institution seeking this information. But this Wednesday TCH asked for information at this institution without administrator, due to reform. While the organizational secretary, Vasil Tole, is on his last day of work after his term expires. The Ministry for Europe and Foreign Affairs has the highest number of verifications from the Dossier Authority. 234 diplomatic service workers were checked at the request of the Ministry and 7 had problems with their ties with the State Security. TCH also asked the Foreign Ministry if seven ex-spies are still at work. Their response was that this process is followed by other competent institutions. Former communist security spies are also in universities. Two former spies with the initials A.M. and I.K. are lecturers at the Faculty of Economics at the University of Tirana. The leaders of this Faculty have the responses with the names of former spies. Because of privacy, no one confirms the full names of 30 former spies, which have been found working still on state's top administration. Three decades after the collapse of communism, the most notorious branches of the state security body have not yeat been cut off. These officials who in the past have signied for the persecution of the others during communisem are still working in the state's top administration.